It's been a while since I have done one of these posts... needed to do it again today because I want to have this to look back on! How i'm feeling: Pretty good - this girl is gettin' big, so I do get a little uncomfortable as the day goes on, but I really can't complain. We are so excited for her! Size of the baby: estimated at 17.8 inches and 4.75 pounds! Wowza. Total Weight Gain: not sure - probably around 15 pounds. It's been up and down. Maternity Clothes: some maternity, some regular. Whatever is comfortable! Movement: lots of it. Girlfriend loves my ribs. And the hiccups! Sleep: it's okay... a little hit and miss. What I miss: we're in the home stretch, so not too much - I see an end in sight. Symptoms: just some slight discomfort in the mornings and evenings. But truly, nothing major! +TL and I celebrated my Birthday by shopping for some needed items for her... I really enjoyed spending the day with him and focusing on her! +every little milestone week. I know she is getting really big in there, so I am just trying to enjoy feeling her move (even though it hurts sometimes) and remember it, because I know I will miss it when she is out. +spending a few more date nights alone with TL. Our plan is to go to a movie together... we know that will be a rare thing after her arrival. +finishing up her nursery... feels like it's never going to get done. Hopefully just another week or two! 34 weeks feels great... it's so exciting to be this far along. You are the cutest preggo ever! You look fantastic! Hope you get some more date nights in. Can't wait to see her nursery!! yay you're getting so close!! how exciting! 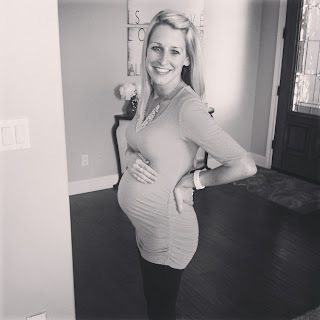 I love how upbeat you around about your pregnancy and how excited you are about Andie's arrival! Lots of moms-to-be are less-than-enthusiastic at this point. :) You look great! Totally adorable! You seriously look amazing - and your attitude is equally awesome, I'm really impressed. You're definitely in the home stretch, which is SO exciting. I cannot wait to see Andie! YAY! You are so almost there! Love following along! You are so adorable! :) I can't believe you're so close to the end! Savor every last minute of it! Just a few more weeks!! You look great! You're so close and look great! Enjoy the date night with your hubby, they do get harder to get out to. But renting Redbox and getting food to-go becomes an awesome date might at home once baby is sleeping. You look beautiful, you are one gorgeous pregnant mama!!! I'm so excited for you, time is just flying by isn't it?!! Hey, Just recently found your blog! It really is so much fun to have pregnancy updates to look back on. I have a 7 month old daughter and it seems like I was JUST doing the weekly updates. You look wonderful by the way! I have a baby gift for you, message me so I can get it to you soon! Wow, you are almost done with pregnancy!! You look great!! YEAH!!! You are looking fantastic and are getting so close to meeting that little lady ~ Waiting anxiously here too! oh you look so adorable, I love this picture. I can't believe how fast it's coming I'm so excited for you. You are absolutely adorable! Seriously cutest pregnant woman I have ever seen! !